The U.S. Department of Justice official who appointed special counsel Robert Mueller to investigate Russian efforts to influence the 2016 presidential election said he is satisfied with the special counsel’s work. 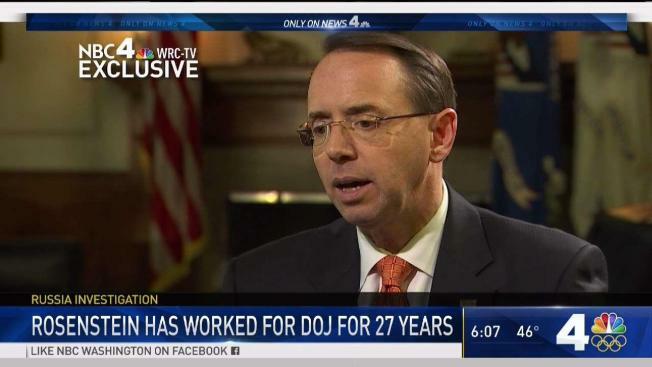 When the News4 I-Team asked Deputy U.S. Attorney General Rod Rosenstein if he was satisfied with the work thus far of the U.S. Office of the Special Counsel, Rosenstein said yes. President Donald Trump has repeatedly called the Russia probe a politically motivated "witchhunt." Only Rosenstein would have the authority to fire Mueller. Rosenstein, a longtime former U.S. attorney in Maryland, told the I-Team in an interview Monday that he was limited in explaining why he was satisfied with the special counsel’s work. At least four people have been charged with violating federal law by the special counsel's office, including former National Security Advisor Michael Flynn and former Trump campaign chairman Paul Manafort. The charges are pending in D.C. federal court. White House attorney Ty Cobb said he has "great respect for Robert Mueller." "We remain committed to working with him toward a speedy and appropriate resolution," he continued. The special counsel's office declined to comment on Rosenstein's remarks. Rosenstein has oversight over the special counsel because Attorney General Jeff Sessions recused himself from the Russia investigation. Rosenstein formally approved the appointment of Mueller. 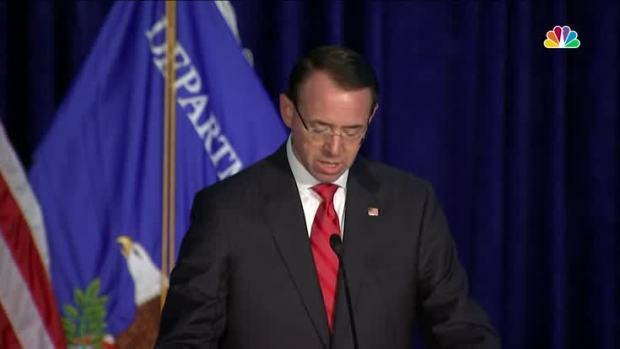 Deputy Attorney General Rod Rosenstein voiced strong support for law enforcement, as well as praise for Attorney General Jeff Sessions, during an address at Tuesday's National Summit on Crime Reduction and Public Safety. He said his team is accountable for the work of Mueller and the special counsel team. 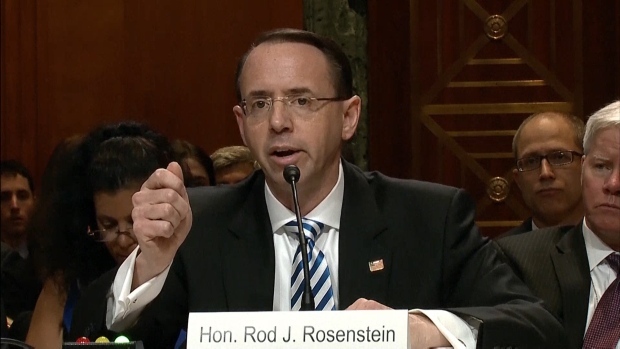 The U.S. House Judiciary Committee announced Wednesday afternoon that Rosenstein will testify before the committee on Dec. 13.